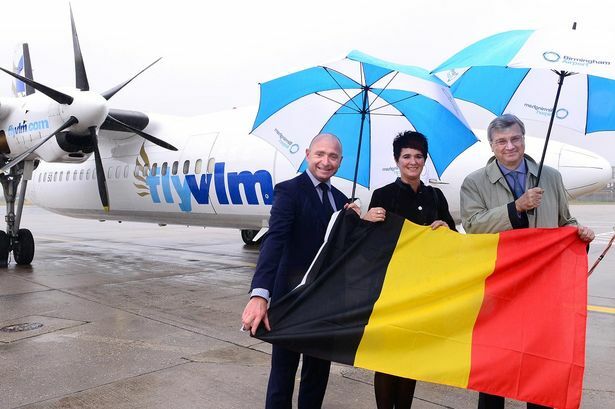 European regional carrier VLM Airlines has launched a direct service from Birmingham Airport to the Belgian city of Antwerp. The inaugural flight was greeted with a water arch salute and passengers were greeted by the Belgian Ambassador to the United Kingdom, His Excellence Guy Trouveroy. Mr Trouveroy showed support for the new service during an exchange of gifts between Antwerp-based goldsmith, Wim Meeussen, and Birmingham-based jewellery designer, Alice Stewart. Steve Blair, chief operating officer of VLM Airlines, said: “This new route not only serves many businesses in the area, but is also ideal for travellers looking for a city break. “Antwerp is a magnificent place, home to one of Europe’s oldest and richest ports, with a bold and diverse arts, fashion and culinary scene. William Pearson, aviation development director of Birmingham Airport, added: “This new route to Antwerp is great news for the Birmingham catchment area - providing a fast, practical connection to one of the most creative and cosmopolitan cities in Europe. Flights between Birmingham and Antwerp will operate three times weekly on Mondays, Wednesdays and Fridays. VLM Airlines also provides scheduled services to seven other destinations in five countries, including Geneva, Hamburg, Southampton, Waterford and London Luton.